Last weekend I was lucky enough to be sent a protein powder of my choice from That Protein. The protein powder is vegan and currently comes in three different flavours. When asked which flavour I would prefer, I was instantly drawn to the Brown Rice with Raw Cacao option. About That Protein’s Brown Rice with Raw Cacao powder: “Brown rice protein is a complete plant protein that helps support healthy muscles, skin, hair and nails. It has a 98% correlation to mother’s milk and a 97% correlation with whey protein. Cacao is a top source of antioxidants and it contains an abundance of magnesium and iron. It is widely recognised for the naturally occurring chemicals it contains which stimulate the happy centres in our brain. 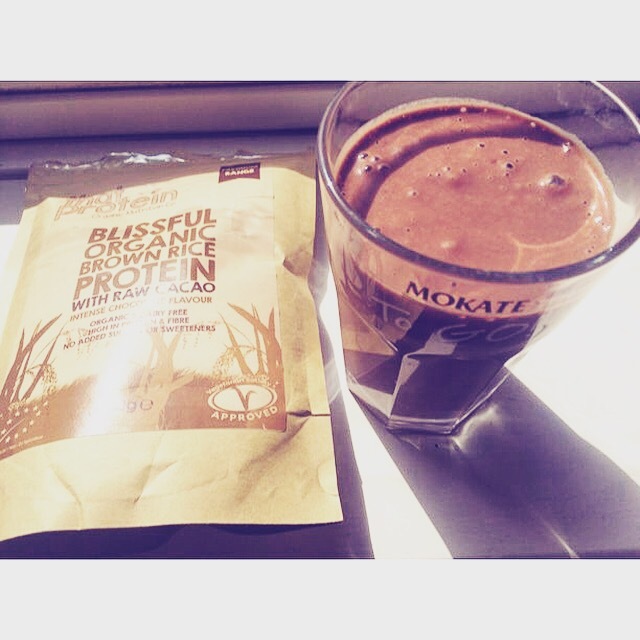 No other food in the world is known to contain as many mood-improving substances as cacao.” That Protein, 2015. I’ve tried a variety of protein powders over the years, but this was before I found out about my intolerance to dairy. I would be really unwell when I followed a lifestyle which included protein powders, which I now know was because of the milk ingredients in the powders. 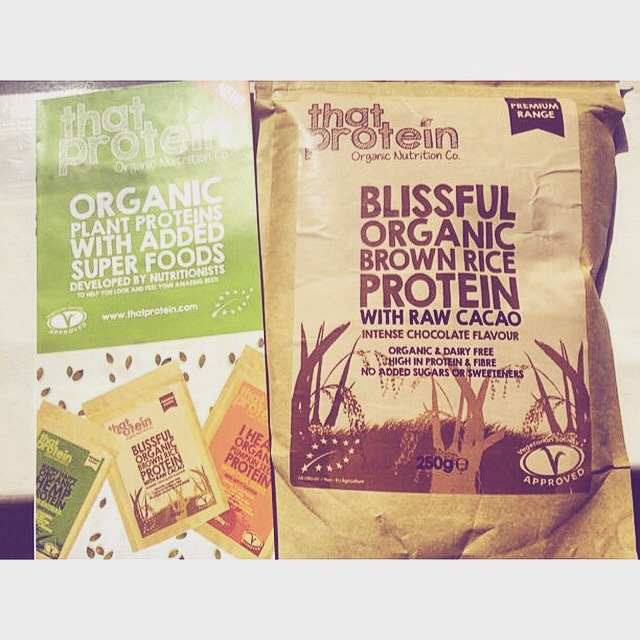 Not only is the Brown Rice with Raw Cacao by That Protein absolutely delicious, but their products are also vegan which is something quite rare in the world of protein powders. I love their branding and I’m impressed with how strong the cacao was. For my first taste test of the That Protein powder, I decided on a chocolate and banana smoothie. I like making smoothies as they are fast and brilliant if I am in a rush. The smoothie was really chocolatey and the banana added to the flavour, which mixed together well. Check out the recipe for the yummy smoothie I made at the bottom of this blog post. The powder is really easy to add to whatever you fancy eating/drinking, just add a spoonful as the packaging suggests. To add texture you can try adding different fruits. Next I am going to see how it tastes mixed in with strawberries and banana. I’m also going to be working on some (hopefully) delicious recipes using the Brown Rice with Raw Cacao protein powder over the next few weeks. That Protein currently have a brilliant offer on, where you get FREE shipping if you buy two or more packs! For more information about That Protein and the products they offer, head over to the That Protein website. This recipe creates a quick and easy dairy free/vegan smoothie! Disclaimer: I received this product to review from That Protein. Although this post is sponsored, all opinions are my own. "8 Photos Of Happiness – Tag, You’re It!" "My Charity Shop Haul – York"